Whether your child is a fussy eater or not, we all know that introducing new foods to young children can be a nightmare! New textures, colours and flavours can be daunting - even to many adults! But with the innovative new Taste 'n' Tell system, your child will be eagerly trying new foods and excited about expanding their food choices. 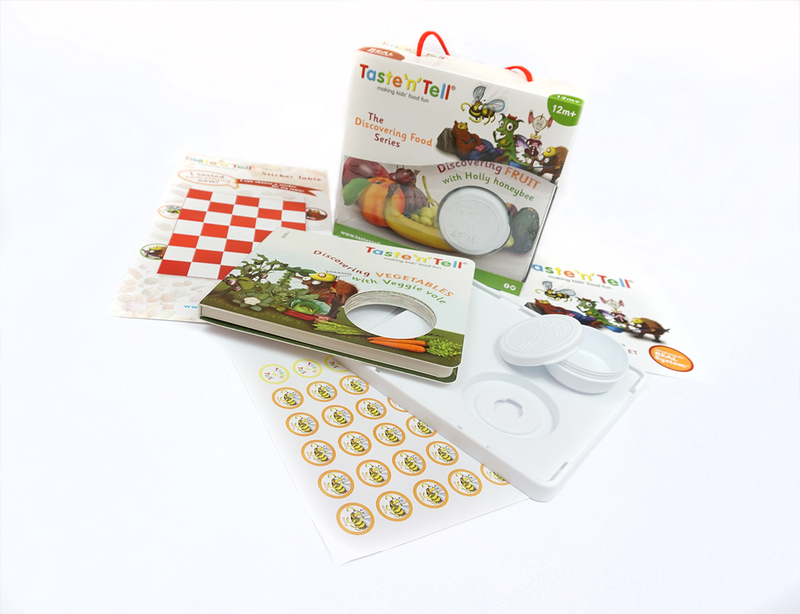 Taste ‘n’ Tell teaches your child to sample new foods, and promotes communication, reading and learning. It helps alleviate fussy eating while having lots of fun with your child! 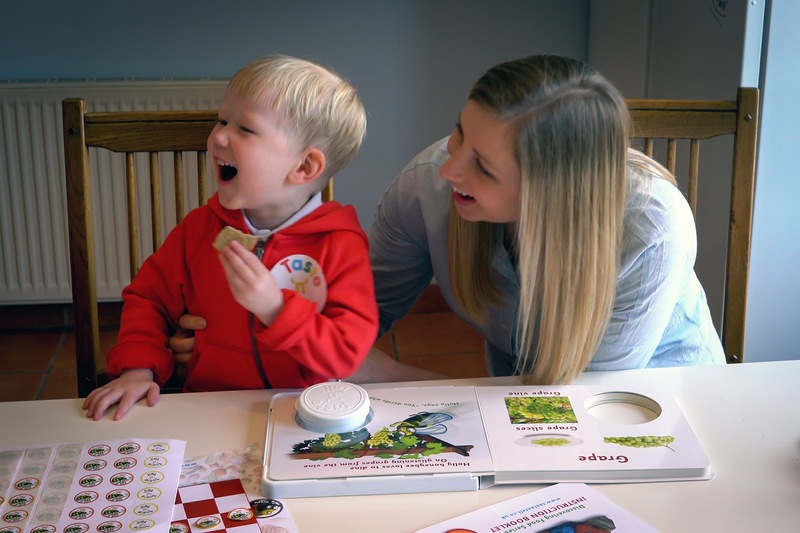 The scientifically proven REAL (Reading • Eating • Learning ) System™ has three key components designed to help you and your child tackle early reading, eating and learning. 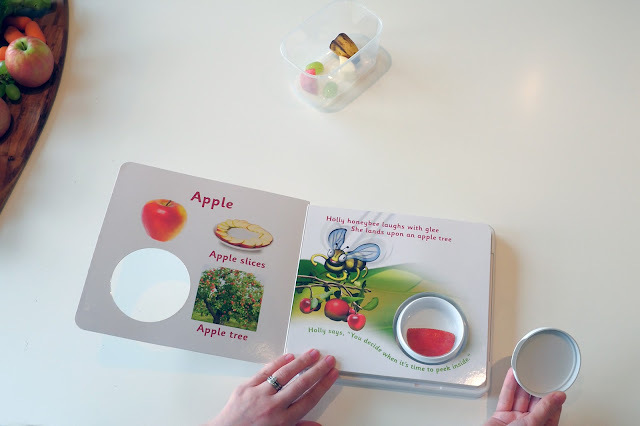 Just place each food in the removable pod and encourage your child to try a new page of the book - complete with new food to try. There are 10 books designed to slide onto the platform base individually. Book one is Discovering Fruit with Holly Honeybee which introduces the concept and gets children excited about new fruits flavours, as well as introducing them to the idea and the fun colourful characters. The customer need only buy the REAL Platform once as the collectable books are removable, and everything is hygienic and dishwasher safe! Full instructions on how to use the book, including a reward poster and stickers, come with the first Holly honeybee book, helping to introduce the concept to parents too. A reward chart is also included for children to collect stickers as they try new foods. The books are designed in a lie-flat board book format and each have eight substantial glossy card leaves. We love their clear, bright layout, perfect for little hands and not too busy for early readers. The left-hand page of each double spread has large vivid photographs of individual foods, showing images of the food. There are three images of each food: in whole form; sliced on a plate; and showing where it comes from, e.g. a tree. On the right-hand side is the character e.g. Holly honeybee, interacting with the illustrated food. There are ten books in the Discovering Food Series with themes related to role-model characters. Each of the characters represent a food group: Fruit, Vegetables, Grains, Protein and Dairy. 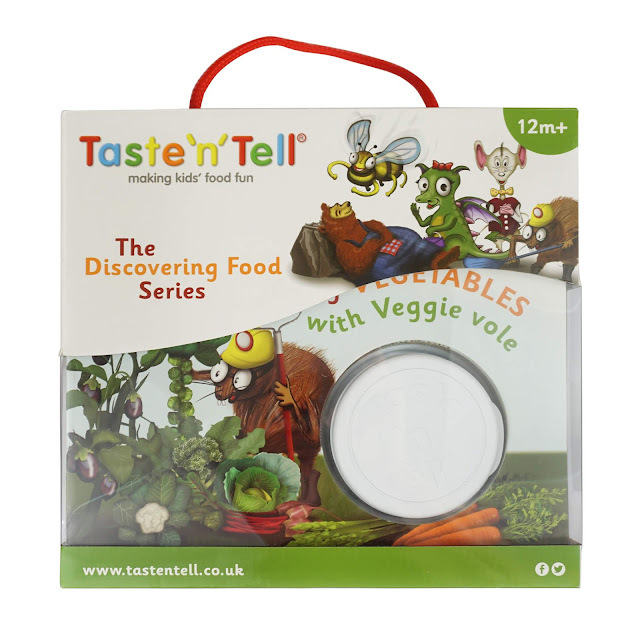 Taste ‘n’ Tell is an exciting new concept for children, and a great way to help children to learn about and sample healthy food. Children love the pod that fills up as if by magic, and the excitement of not knowing what new food it might be today. We have a Taste ‘n’ Tell two book fruit and vegetables pack to give away. If you would like to win one, just enter via the Rafflecopter below. Only one entry is needed to enter the giveaway, but the more times you enter, the greater your chances of winning! And don't forget to come back each day for our free daily entry and to send out the competition tweet. This giveaway ends at midnight on Friday 1st March 2019.